Are you an adult thinking you may be too old for braces? Have you always wanted straight teeth and a confident smile but have shied away from a mouth full of metal? Is There A "Best" Age For Straightening Teeth? 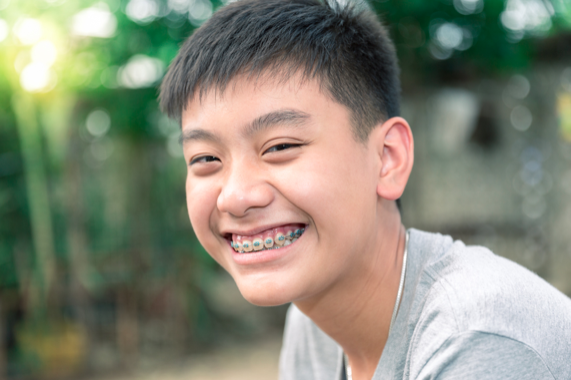 You may be aware that the American Association of Orthodontists (AAO) recommend an orthodontic evaluation beginning at age seven with the majority of straightening teeth during the teen years. Perhaps you have younger children or teenagers who are just getting braces or have been through their orthodontic treatment to result in their own beautiful, confident smiles. Orthodontic treatment can be beneficial at ANY age. The AAO also states that one in four orthodontic patients are adults! Adult teeth are also able to be moved using braces or Invisalign®. Thinking braces and Invisalign® are only for children and teens shouldn’t be a deterrent to achieving the straight smile you have always wanted. While we offer clear porcelain brackets and tooth colored arch wires for our adult patients choosing a more discreet orthodontic process, we equally treat a large amount of adults with the Invisalign® straightening treatment option. Invisalign® clear aligner trays are made from a clear, comfortable, medical grade acrylic material that fit over the arch of your teeth, and are often undetectable. This means no bulky metal and no potentially uncomfortable comments from friends and acquaintances. Another major advantage of Invisalign® for our adult patients is the fact that the trays are removable. 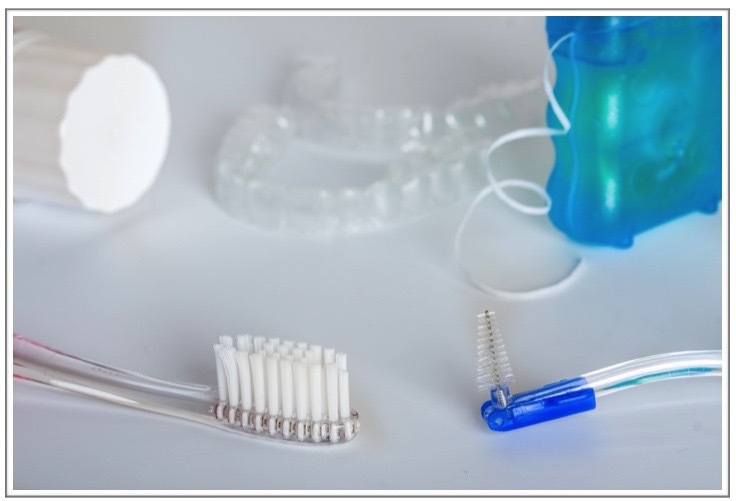 Removable trays mean patients are able to brush and floss teeth as normal, maintaining their normal oral hygiene regimen throughout the entire straightening process. This also allows patients the flexibility to remove their aligners for eating as the recommended time to wear them is 22 hours per day. Adults often become confused on just who to choose as their Invisalign® provider as many dentists are now offering Invisalign® as a dental service. 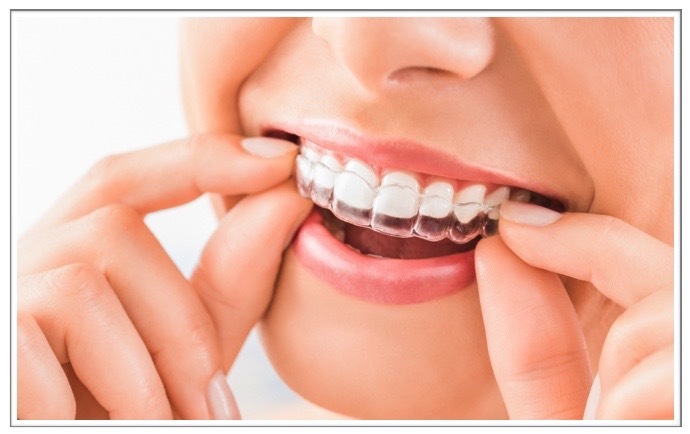 While it may seem easier to purchase Invisalign® through your dentist and not switch between dental and orthodontic practices, dentists often do not have extensive experience or broader understanding of orthodontic tooth movement compared to orthodontists as they have not gone through the extensive orthodontic schooling and training that orthodontists must acquire. At SmilesForever Orthodontics, we are confident that the extra years of study and experience Dr. Brad Gilbert and Dr. Adam Wells have achieved will provide a more comprehensive treatment for you. Our highly trained SmilesForever orthodontists and our orthodontic team understand the complexities of the mouth and have a thorough understanding of all orthodontic treatment, allowing us to offer the best treatment for your needs. Invisalign®, in part, relies on the compliance of the patient. As the aligners are removable for eating and cleaning, some patients find it hard to remember to wear them or choose only to wear them at certain times. While offering the flexibility of briefly removing them, leaving them off for extended periods of time will limit the effectiveness. As mentioned previously, it is very important to wear the aligners as instructed by the orthodontist, typically 22 hours per day to ensure optimal results. No two mouths are the same and your mouth is uniquely yours. 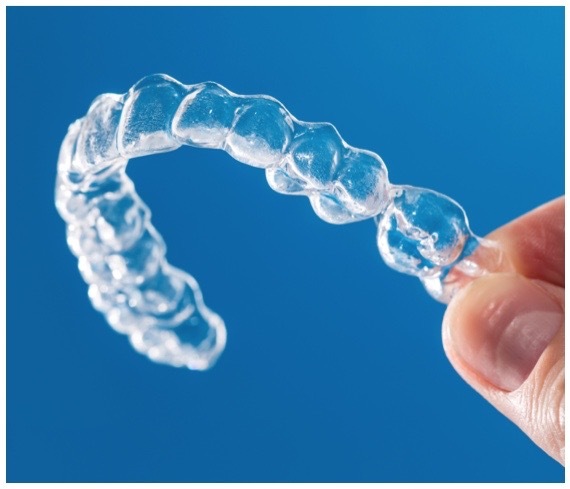 Invisalign® has helped thousands of patients around the world achieve the cosmetic results they were looking for. However, there are a few instances where the Invisalign® system may not achieve optimal results. For example, problems concerning bite, crowding or an over abundance of space, to name a few, may require treatment such as traditional braces. The best way to know whether you are a good candidate for Invisalign® aligners is to come in for your FREE orthodontic consultation with SmilesForever Orthodontics where Dr. Wells and Dr. Gilbert will help you to make the right decision for you. We're celebrating National Pi Day! How many of our SmilesForever Logos do you see? 314 in celebration of National Pi Day! 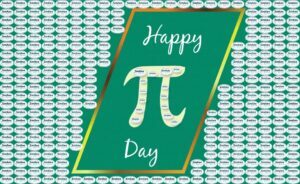 Our SmilesForever Orthodontics doctors and staff are SO excited it's National Pi Day! No - not THAT kind of pie - we're talking about pi or π! Written as 3.14, pi is a number representing the ratio of a circle's circumference to its diameter. We calculate the circumference of a circle by multiplying its diameter by pi. Pi is thought to be a special number because it is an irrational number, meaning that it can't be expressed as a simple fraction. Mathematicians, scientists and other curious people have been fascinated by pi for hundreds of years trying to determine whether there is a pattern to its digits or whether they are completely random. 58209749445923078164062862089986280348253421170679... we can TRY to be MORE precise but pi literally goes on forever! Why do we celebrate National Pi Day? National Pi Day came about in 2009 to promote mathematics. Our SmilesForever Orthodontics staff loves Pi Day because many businesses celebrate with pie deals. Yes - THAT pie! Pizza, fruit, cream, pumpkin, sweet potato, chicken, yummy, braces-friendly PIE! "Pies don’t have to be round. On National Pi Day (Thursday, March 14), visit Bojangles’ to experience three rectangular-shaped Sweet Potato Pies for the fitting price of $3.14." "For Pi Day this year, Kroger grocery stores will offer fruit-based, sweet potato, pumpkin and no sugar-added pies for just $3.14, which is over 30 percent off their regular retail price." "If you love Boston Market's Pot Pie - click on the link below or go to their website to download a coupon for a Buy 1 Pot Pie & A Drink - Get 1 Pot Pie FREE!" Albert Einstein was born on pi day in 1879. Pi is the number of times that a circle's diameter will fit around a circle's circumference. Without knowing the true value of pi, it's impossible to find the circumference of a circle. The first 31 digits of pi contain NO zeroes. However you choose to celebrate - we wish you Happy National Pi Day from Dr. Brad Gilbert, Dr. Adam Wells and our SmilesForever Orthodontics Team! New Braces and a Sparkling New "Bestie"! Wondering How to Get Along with Your Braces? You've taken steps toward gaining a healthier, more confident smile by choosing orthodontic treatment. Now you're wondering how the heck you're going to get along with these life-changing sparklers over the course of your treatment. Don't worry - you and your braces will become good friends over the coming months or years. In fact, they'll become your sparkling new "bestie" by getting your relationship off to a good start! Remember to floss! 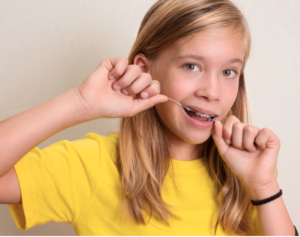 We understand it’s difficult to floss around your braces, but it’s the best way to prevent gum disease and other oral health problems. Ask our staff for floss threaders to make the chore easier - we'll happily show you how to use them! Unhealthy gums turn red and often bleed when brushing. Just a few minutes of flossing each day will help keep your gums and teeth healthy while in braces. Avoid those hard, crunchy, sticky or chewy foods - your braces and your orthodontists will thank you! These foods can break wires, brackets and your teeth too and Dr. wells and Dr. Gilbert believe it's best to avoid them altogether. We have several boards with yummy braces-friendly recipes on our Pinterest page. Start with our Braces-Friendly School Lunches board. Try chewing foods with your back teeth, especially if you’re used to taking large bites with your front teeth. Try instead, breaking or cutting smaller pieces of food and placing them into your mouth to chew using your back teeth instead of biting into foods with your front teeth. Taking large bites of food with your front teeth can break a bracket off! Do your homework and always wear your rubber bands, headgear and other orthodontic appliances as instructed! Wearing these may seem annoying at first but that will quickly change once you get into the habit. Besides, it's proven that not complying with wearing them can increase the length of your treatment. Check out our Pinterest page Taking Care of Your Teeth and Braces and always feel free to call us with any concerns or questions - we're here to help you LOVE your braces and smile! Reminder To Use Your Flex Spending Accounts! Can you believe the 2018 year is quickly coming to an end? As the calendar winds down toward 2019, we know many of our patients are anxiously keeping an eye their flexible spending balances, and trying hard not to squander any of their hard-earned dollars which has accumulated for medical and dental expenses over the past year. 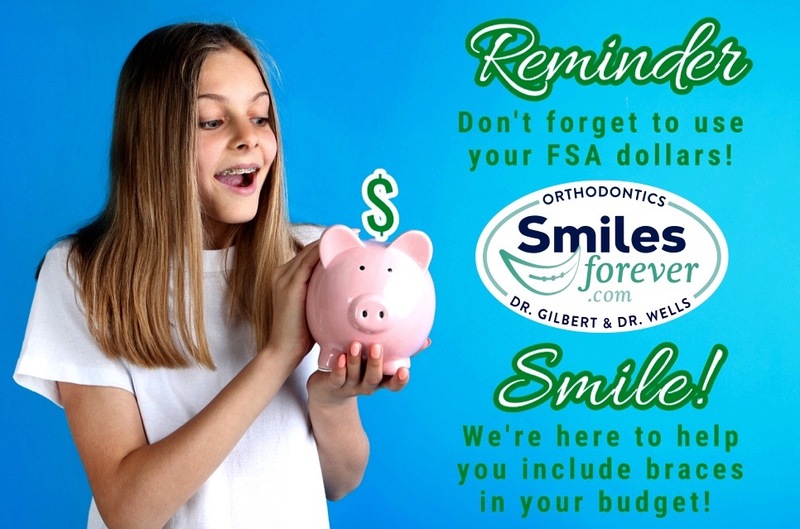 That’s why Dr. Brad Gilbert, Dr. Adam Wells and our SmilesForever Orthodontics team would like to give those patients with Flexible Spending accounts a friendly end-of-the-year reminder that it is time to schedule a visit so that you can optimize your benefits! Whether you are currently in treatment with an active payment plan or are thinking about starting orthodontics for yourself or a family member, it isn’t too late to take advantage of available funds. Did you know that orthodontics are covered under these FSA and Health Savings account plans? Yes, we get that question a lot and are so happy to let our patients know that the orthodontic services we offer including, orthodontic appliances, traditional braces, clear braces, diagnostic x-rays and Invisalign are all allowable expenditures under these plans. Consultations are also covered under FSA plans but you don’t need to worry about budgeting for first time consultation fees because they are always complimentary with our doctors at SmilesForever Orthodontics! At SmilesForever Orthodontics, we work hard to meet your needs, while in the treatment chair and when it comes to payments and insurance. Our doctors and team never want financial obstacles to keep anyone from receiving the orthodontic care they need and our treatment and insurance coordinators take pride in helping our patients budget and save! We’re here to help if you have any questions regarding planning your 2019 FSA and Health Savings open enrollment, your orthodontic insurance, your treatment and your accounts, just give us a call! Our practice tends to be quite busy during the holidays when schools are closed and many adults have free time away from work. By calling any of our four locations in Dacula, Duluth, Flowery Branch and Loganville, GA soon, we can help you budget your FSA dollars toward your treatment so that you can “use it before you lose it” and also help you in planning for your and your family’s gorgeous smiles next year!